The term “Elasmobranch” is a collective name for the sharks, skates and rays. Elasmobranchs have a skeleton made of cartilage, no swim bladders, five to seven pairs of gills opening individually to the exterior, rigid dorsal fins, and rough skin made up of small dermal denticles. 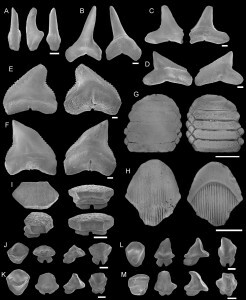 The upper jaw of Elasmobranchs is not fused to the skull and they have several rows of teeth which are continually replaced. Most sharks have a torpedo-like streamlined body whereas skates and rays have flattened bodies. In European waters, the name skate typically refers to the long-nosed larger species such as the Common Skate (Dipturus batis) and the term ray refers to smaller species such as the Thornback Stingray (Raja clavata). In fact these species are all skates because they lay eggs (oviparous) and the true rays are actually the species which give birth to live young (viviparous) such as the Eagle Stingray (Myliobatis aquila). For ease of use, we will stick to the European common names for the species. 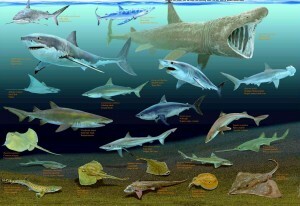 About 400 species of shark and 500 species of skates and rays have been described. 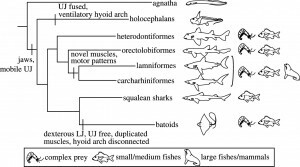 Elasmobranchs are not the only cartilaginous fish in the sea but are members of the larger group called Chondrichthyes which also includes the Chimaeras. These are very unusual fish which have the same cartilage skeleton as Elasmobranchs but have smooth skin without any dermal denticles and only a single gill opening. 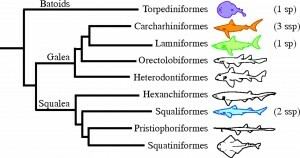 Their upper jaws are also fused with their skull and instead of the replaceable rows of teeth they have three pairs of large grinding tooth plates. They usually live in the deep ocean and very little is known about their biology. Elasmobranchs are renowned for their highly tuned senses, which make them incredibly successful in their environment. Their sense of smell is very sensitive and most species have large nostrils that allow a large volume of water to flow continually over their olfactory organs. Surprisingly, hearing is also a very important sense to Elasmobranchs and they have well developed ears. There is no external sign of this except for two tiny holes behind the eyes. Hearing is often the first sense to detect prey at long distances and it is used in conjunction with a special sensory organ called the lateral line which is a line of pressure detectors that runs down each side of their body. These detect changes in water pressure that might result from struggling prey. Around their snout and mouth are more special sense organs known as the “Ampullae of Lorenzini” which detect electric fields given off by prey. Many sharks also have very good eye-sight and the great white can even see when its head is out of the water. 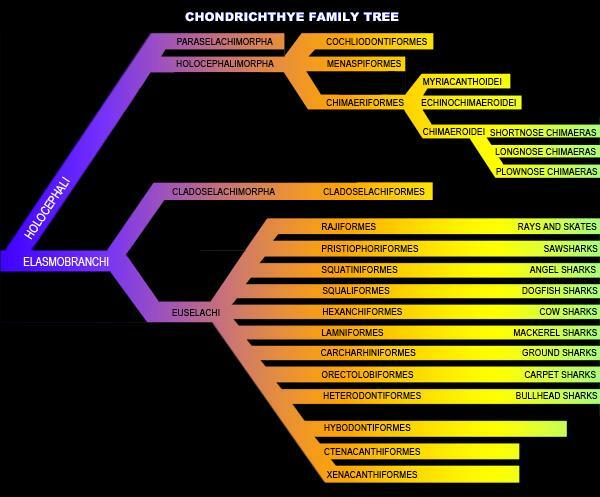 When combined, all these sense make Elasmobranchs extremely good hunters and helps explain how they have managed to survive for 400 million years. 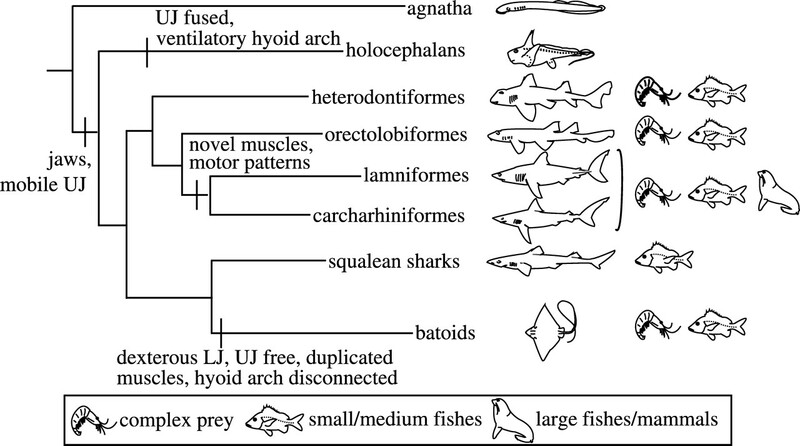 All Elasmobranchs unlike bony fish, practice internal fertilization when reproducing. Therefore they occur as either male or female. Female sharks have no obvious external reproductive structures, whilst males have two extensions of the pelvic fin known as claspers. These claspers are used by males during reproduction to internally fertilize the female sharks. Some species of shark such as the Spotted Dogfish (Scyliorhinus canicula) and all skates lay egg cases on the sea bed or wrapped around seaweed. This is called oviparity and the young develop within the egg cases whilst being nourished by a ball of yolk. These egg cases are often found washed up on beaches and are common known as a “mermaid’s purse”. By recording where these egg cases are found we can get important information on the distribution of skates. In all other sharks and “true” rays the young develop inside the mother in much the same way as in mammals. This is known as viviparity and the young may stay in the mother for anywhere up to two years depending on the species. This form of reproduction can be further divided into two categories the first is aplacental viviparity whereby the developing young are nourished either by a yolk ball, by absorbing secretions from the mother (histotrophy), by eating extra eggs (oophagy) or even by eating their siblings (embryophagy). The other form is placental viviparity whereby after using up their yolk ball the young develop a placental connection with the mother. Some species of shark have been shown to return to the same areas where they were born to give birth similar to the way salmon return to their native river to spawn. They may also have specific nursery areas where young can safely grow up away from other major predators. These areas can be very important for the survival of species but very little is known about them for most species. 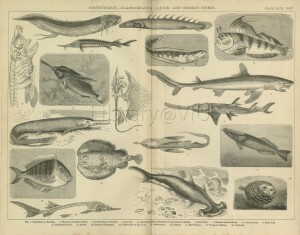 Elasmobranchs have many extra special adaptations for living and hunting in the sea. The rough skin which is characteristic of the group is due to a covering of hard tooth-like scales called dermal denticles. These vary in shape and size between species and help reduce drag and resistance in the water. 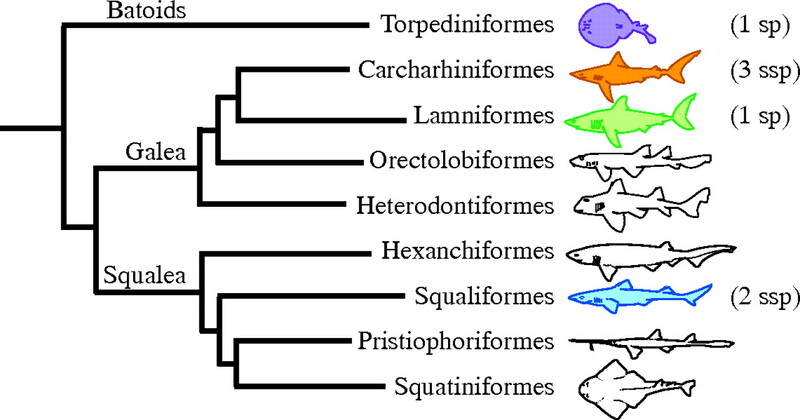 Shark teeth are highly adapted for the type of prey that the particular species eats. For example, the Smooth-hound Shark (Mustelus asterias) is a specialist and feeds solely on crabs therefore it doesn’t need shark teeth and has flat crushing type teeth instead. The Porbeagle Shark (Lamna nasus) only eats fish therefore it has long sharp pointed teeth that are ideal for piercing and catching fish. The Bluntnose Sixgill Shark (Hexanchus griseus) is a deep-sea shark that has a wide variety of prey species and is probably just an opportunistic feeder. They eat mollusks, crustaceans and also fish therefore they have a mixture of shark teeth and also serrated cutting teeth so they can eat anything they find. 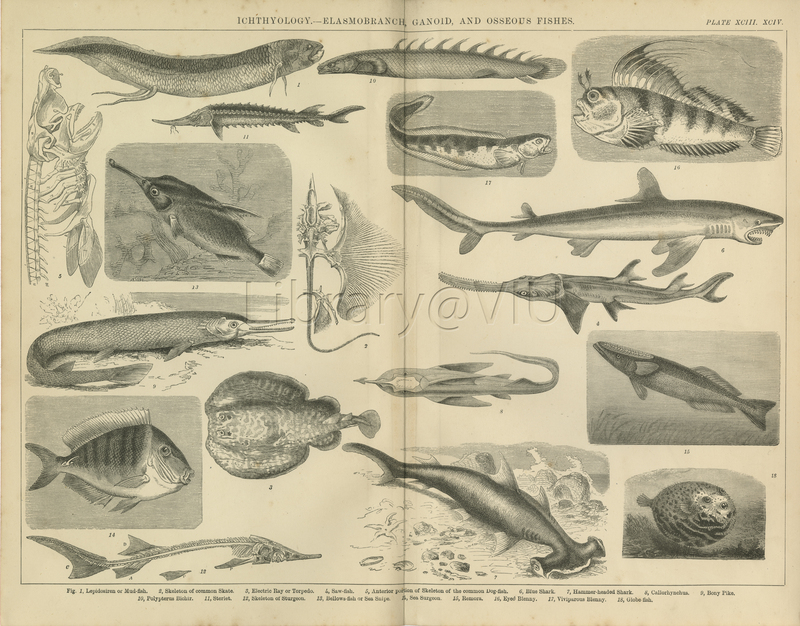 There is still much to learn about the biology of Elasmobranchs. In fact so little is known that new species are regularly described and some others such as the Megamouth Shark (Megachasma pelagios) which can grow to around 6 meters in length are known from only a couple of specimens. Thankfully research efforts are now being directed towards understanding and conserving these magnificent animals rather than eliminating them as was the case in by gone years.